Mike Harrison of Hunter's El Cajon office meets with a crowd of around 250 constituents on Tuesday, Feb. 21 asking for his boss to come out and meet them in-person. Just not at his El Cajon or Temecula district offices. 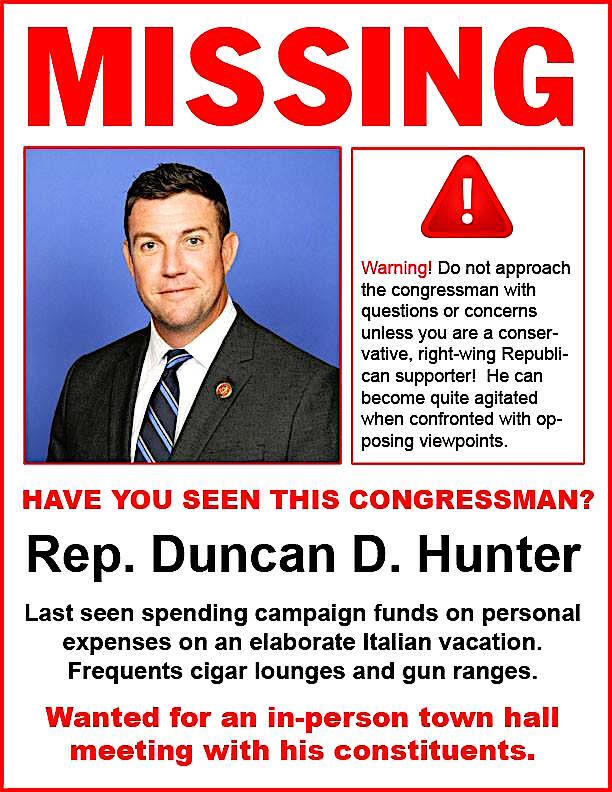 When it comes to tearing down high school art from the Capitol, Hunter seems fearless, but when it comes to constituents visiting his El Cajon or Temecula office or holding an in-person town hall, that gumption apparently turns to fear. Hunter’s deputy director Wednesday sent an email to Indivisible North San Diego County constituents saying that anybody going to his district offices to ask for an in-person town hall or to address issues will be charged with trespassing. Sheryl Brown, an Indivisible North San Diego County spokesperson said: “I was shocked and surprised by Mike’s comments, especially because he had just been interviewed the week prior and he had commented on camera that he had had a good meeting with us and we were civil and decent in our meeting with him. “As far as his allegations that we disrespected law enforcement, intimidated constituents coming to his office, video or filmed in is office, all I can say, is ‘not on my watch.’ I can’t account for all of Hunter’s constituents that are unhappy with him, but I can account for the meetings I have had with Mike Harrison,” Brown said. Washington dysfunction under the Trump era has resulted in the indefinite postponement of action by the Office of Congressional Ethics (OCE) against Hunter for campaign finance law violations. Hunter already has repaid over $60,000 he and his wife who doubles as campaign manager spent on personal expenses, thereby violating campaign ethics rules. OCE staffers this week said no action could take place without a full committee. This comes on the heels of a vote behind closed doors last month by the House Republican Caucus to abolish the ethics office. When word became public, public outcry caused Republican House members to walk back that vote. Hunter voted to abolish the office that is investigating him. Say what one will about Hunter and his ethics violations, he has shown himself to be a generous spender of taxpayer dollars when it comes to paying office staff. His staff salaries are consistently 50 percent greater than the congressional average, according to InsideGov.com. 4 Comments on "Hunter: Arrest protesters for trespassing"
Clearly, it is time to work on voting him out of office. That needs to be our main focus. Time to scrape the scum off the pond. I voted for you, I think I’m entitled to share . views and you’re INDEBTED to listen! His office et al, forgets they work for us. It’s time to wipe him out next year. He’s only in it for the money and he doesn’t care whose money it is, he takes it all for himself. What a disgrace to our district and to his fellow Marines who he once belonged with. It’s not his office, it belongs to the people in his district. He’s there to serve them not to discourage them from their rights to meet with their congress person.